Another awesome update from Snapchat. Now, you can turn yourself into Deadpool by using this new filter on Snapchat. Find out how to get this filter lens and how to use it. Deadpool is a flamboyant mutant, the movie is nothing more than entertainment with a unique synthetic dark comedy with satire dialogue. The main character, Wade Wilson (Ryan Reynolds), use the costume that look like Spider-Man, but if see it kinda dirty, and his behavior is worse. Now he is taking over Snapchat with this new filter. Every time Snapchat released a new feature, what you have to do at first is update your Snapchat app. If you are using iPhone or iOS, go to App Store, and if you are Android user, go to Play Store, under My apps and check for the updates. Launch your Snapchat app and take a picture like you always do, tap and hold on your face and wait until the app recognize your pretty face. The filters will show up, choose the Deadpool icon to apply it to your face. That’s it, but you can also add a caption or emoji. When you ready, send it to your friend or post it to your stories. Deadpool filter on Snapchat was a promotion to welcoming the release of the Blue-ray version. The movie was very popular back then, become the top 5 of highest-grossing films for the year. This is not the first time that similar advertisements have ran on Snapchat. Previously we got Batman filter and Wonder Woman filter as well. Looks like you will also get the thumb up from Deadpool. Recently Snapchat also updating the app for iPhone and iOS with the ability of zoom in with one hand. 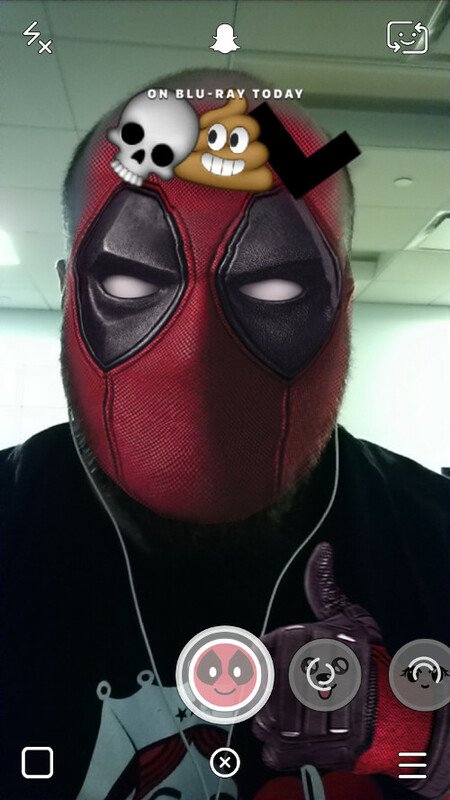 Go on, tell your folks about this awesome Snapchat Deadpool filter.